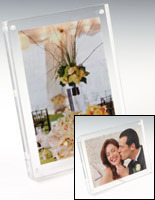 Each Acrylic Photo Block's Stylish Design Fits with Any Background. The Photo Displays comes with (2) 6mm Thick Blocks to Hold Pictures. This Acrylic Photo Block if Purchased Before 1PM EST Monday – Friday Qualifies for Same Day Shipping. 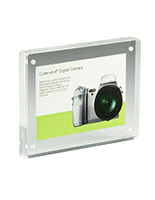 The acrylic photo block can be used in retail stores. 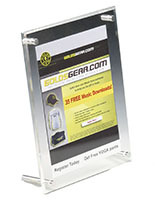 The display is perfect for holding graphics on office desks, mantles or retail countertops. 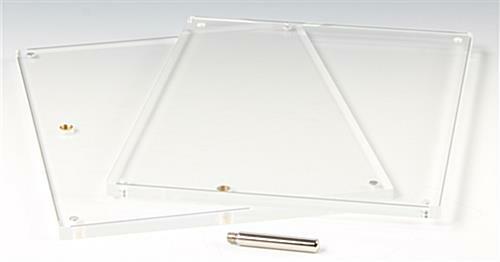 Each acrylic photo block that is compact takes up minimal space on desks. The picture display's modern and contemporary look also makes this a perfect tool to be used in showrooms and front offices! 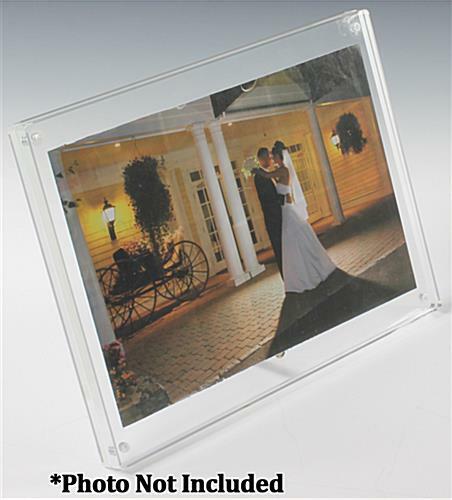 This acrylic photo block's frameless feature means photos up to 5-3/4"w x 7-3/4"h will fit. The display has no matted edges or frames that can potentially take away from the graphics being held. 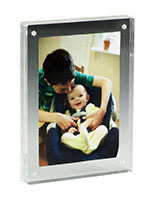 Each acrylic photo block's frameless feature makes it easy to change pictures being held. There is no longer any difficulty of messing with backers or matted edges held in place with retainer clips. 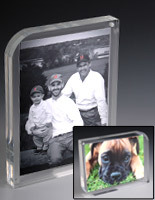 The acrylic photo block fits in seamlessly with glass countertops! These picture displays are even easier to change as the magnetic corner can easily be separated when changing out graphics. 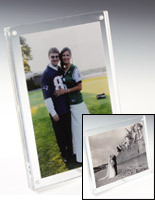 Each acrylic photo block has (2) .25" thick slabs that hold the pictures in place. The display's clear panels make it easy to focus on the images being showcased. 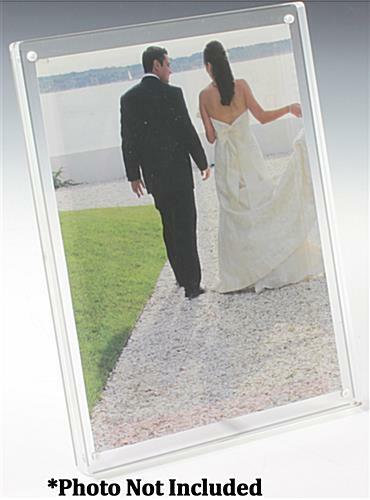 This acrylic photo block's thick construction allows for a longer life! 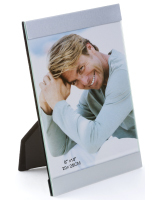 The picture display has a relatively small footprint, allowing for the holder to be placed in small spaces. 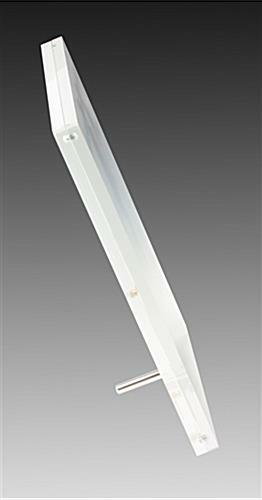 This acrylic photo block comes with one silver rod to hold up the frame. 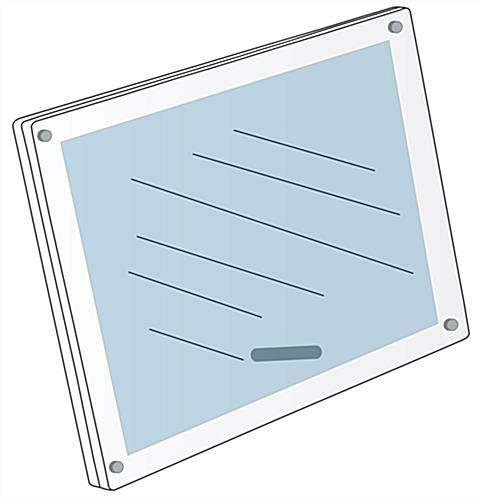 The picture frame provides a neat and sleek way to display a favorite image or graphic.